The day after completing my first SWAT school I found myself taking cover behind a big tree backing up the county on a homicide warrant. It was about 0430 hrs and you could cut the humidity with a knife. They threw a flash bang after breaching the door. As the shield man went through the front door of the single wide trailer, the suspect, who was sleeping with a 12 gauge on his chest, rolled off the couch and pulled the trigger launching a slug between the first and second guys through the door. That slug went through the corner of the trailer and traveled about 25 feet before slamming into the tree about 3 feet above my head. That situation and many others solidified my belief that you never know how long after receiving training you might end up in a position where you needed to use it. During another SWAT school, we were supposed to have an early morning mock call out. Our team was already active and guess what? We had a real world call out early that morning. One day during a SWAT training day we got a call out to respond just a mile away from where we were training for a hostage recovery. A woman was being held by a drug dealer in a van in the parking lot of a hotel just off RT 95. All these incidents were resolved without incident. Again, the point is that you never know when you will need to put old and new training to use. At MCS, this is our mindset when we train. Will what we are teaching work if the student needs to use it that night? Everything we teach is based on combating failure with redundancy. Basing your defense on predetermined, fine motor skill based responses will fail you, while principle based responses using gross motor allow you to prevail. 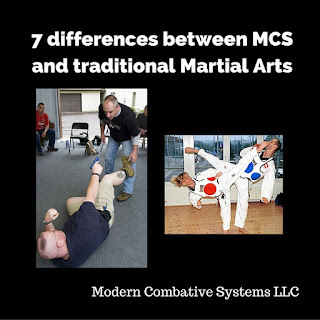 The basics of our open hand combatives system are covered in SAS (Spontaneous Attack Survival). SAS is a four hour class. Yep, you read it right, a four hour class. What else is different about it? We treat every attack as if it were an edged weapon attack. Here’s why. You can tell alot about the depth of the instructor you are talking to by their response. Again, many consider any open hand response to edged weapons to be very advanced. So much so they will often bring in a special instructor for it. Whatever they teach will likely have no continuity at all with what you have previously been taught. The edged weapon is the most likely deadly threat because designed and improvised weapons are all around us. Take a walk through the Dollar Store and see what you can come up with. One of our favorite training tools is a Dollar Store box cutter with the blade removed. Unlike firearms and impact weapons, edged weapons need very little movement to produce mortal wounds. What kind of confidence can you have in a system that considers something as common, primal, and brutal as edged weapons advanced? When they do teach edged weapon defense, it is against weapons that are about 2-3 times the size of what you face on the street and predicated on seeing the weapon. They have no understanding of the reality of an edged weapon attack. If you have been following me for a while, you know that I had two buddies I bounced with attacked with a Spyderco Civilian outside a bar. Tom took one cut to the neck and bled out on the way to the hospital. Marty has a scar on his face to remind him of the attack every day. Marty, who is no stranger to violence, said he never saw the knife even after Tom was attacked. When he himself was attacked, he thought he got punched. I have yet to interview someone who was attacked with an edged weapon in a standoff (21 foot rule) position. SAS is meant to give you the alphabet, and then make some words to defend against what we consider the three most violent edged weapon attacks you could face. Then we pressure test it. Some have you run around, do push ups or whatever to get your pulse up. That does little to increase your adrenaline. So what do we use? We use stun guns. Nobody likes to be electrocuted. Everyone has the same primitive response. Some people have had panic attacks and hyperventilation in anticipation of doing the drills. The stun guns accomplish two primary things. They make people drive through pain and to not stop until the attacker is physically incapable of doing any more damage. There is no room for slop. So when you defend against an open hand attack, impact weapon, or an edged weapon you can see you are more effective. 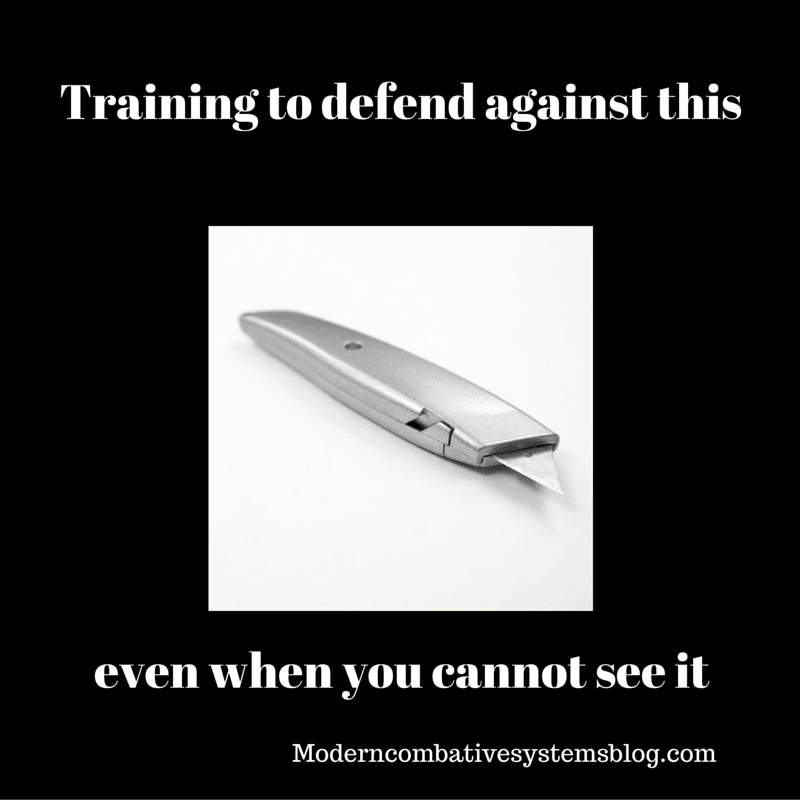 We assume that when dealing with someone showing no visible weapons, they at least have a box cutter that we can’t see..
SAS leads to two other MCS courses; Arrest & Control for law enforcement, and PRT Passive Restraint Tactics for anyone that may have to physically control people while employed in a custodial role. This is primarily for schools, hospitals, and nursing homes. The foundation of SAS, Arrest & Control, and PST is Combative Anatomy. There are many skeptics who believe it is impossible to teach anyone to effectively defend against edged weapons in four hours. What they all have in common is that they have not been through the class. They wonder how we can teach principle based responses that allow a measured response from open hand control to deadly force. I am more interested in those that have attended the class and endorse it such as the US Air Force Special Operations Commands DAGRE (Deployed Aircraft Ground Response Element) Hurlburt Field FL, Maryland Department of Corrections Special Operations Group, and Indiana Department of Corrections defensive tactics training team. What do these people have in common? They are experienced and have had all kinds of snake oil salesmen paraded in front of them selling their wares. They know what is realistic and what’s not. At the end of the SAS course people are able to take what they have learned and start making longer words, then sentences, and then paragraphs. Once you are comfortable with fighting at contact distance,, fighting at any distance becomes easier. What if time, money, or geography keeps you from attending an SAS course? We realize that not everyone will be able to train with us in person. For this exact reason we are working on the SAS Manual & SAS DVD. No, it will not be the same as training with one of our instructors. But we are doing our best to break down the information so that you can practice it with one or a few other dedicated people with little to no equipment. We will also have a forum to provide free advice and coaching. Until then, stay safe out there and look out for all the nonsense. 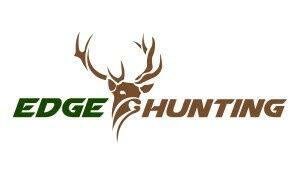 If anyone would like to schedule an SAS, Arrest & Control, and PRT, contact us at 717-693-2085. All three courses are also included in our Total Officer Survival Course.